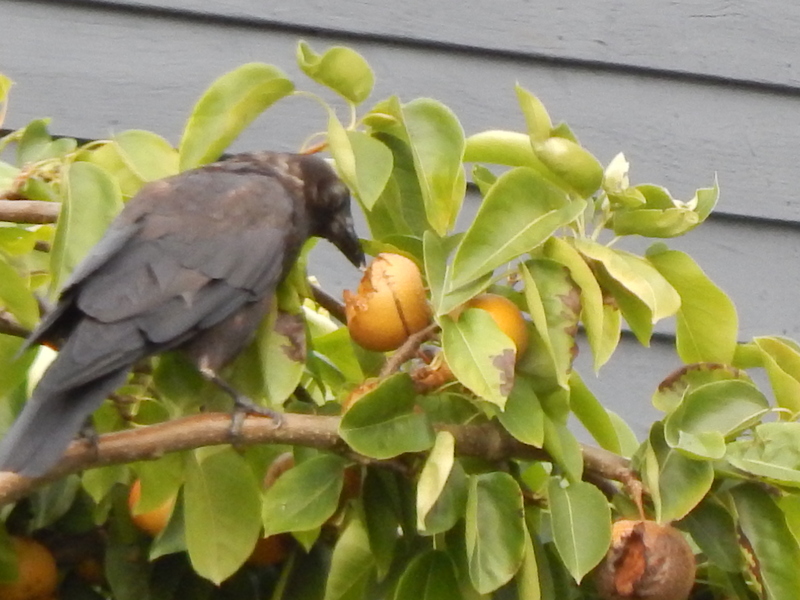 One of my backyard local murder has found the neighbor’s asian pear tree. Last year when the pears got ripe the family came out and plucked the tree clean of this delicacy. Not sure if they will again this year but the crows being the opportunists they are have been snacking away. Hard not to notice the poor condition of this birds feather. It has continued to be a very intense molting season this year. See how his elbows, around the eyes and neck are bare and even look abused. Part of this is from sitting on their nest for so long but also how hot Seattle has been this summer. Funny how most crow pictures show them all pretty black and sleek. Life is not quite that picture perfect. I feel bad for my neighbors but am happy the crows find such joy in the tree. If they do not pick the fruit it could ferment. The birds who feed on it then will get drunk and act really goofy. I have seen cedar waxwings (a bird slightly smaller than a robin that are brownish cardinal looking) do that when feeding on fermented berries on madrona trees. So, remember humans are not the only ones who love the fruit of late summer and early fall. Oh wow I can really see what you’re talking about in this photo of the molting! His poor little eye and elbow! I wonder if it’s painful? I still think he’s handsome, though.